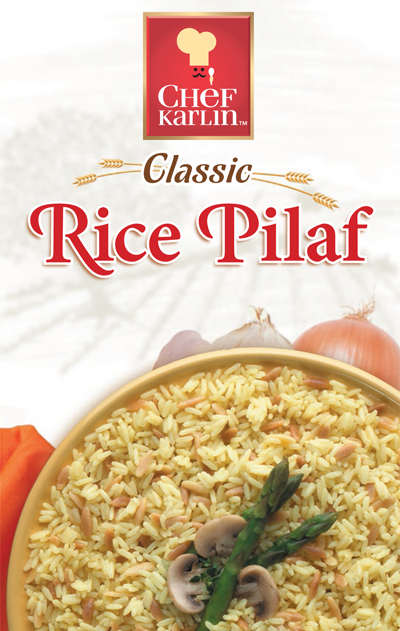 With several different options to fit any need, Chef Karlin rice products make an excellent addition to a grocery product lineup. If we can be of any assistance, please don’t hesitate to contact us. Ingredients: Long Grain Rice, Orzo (Pasta made with Wheat Flour), Salt, Autolyzed Yeast Extract, Onion*, Garlic*, Turmeric (color). In medium saucepan, bring 1¾ cups water and 1 tablespoon butter* just to a boil. Stir in rice and contents of seasoning and orzo packet. Cover; reduce heat to low. Simmer 20 to 25 minutes or until most of water is absorbed and rice is tender. Remove from heat and lightly fluff with a fork before serving. * Olive oil may be substituted for butter. In a 2-quart microwaveable casserole, combine rice, seasoning and orzo packet, 2¼ cups water and 1 tablespoon butter*. Cover and microwave on HIGH 18 to 20 minutes or until most of water is absorbed and rice is tender. Let stand until about 5 minutes until all water is absorbed. Lightly fluff with fork before serving. Caution: bowl will be hot.